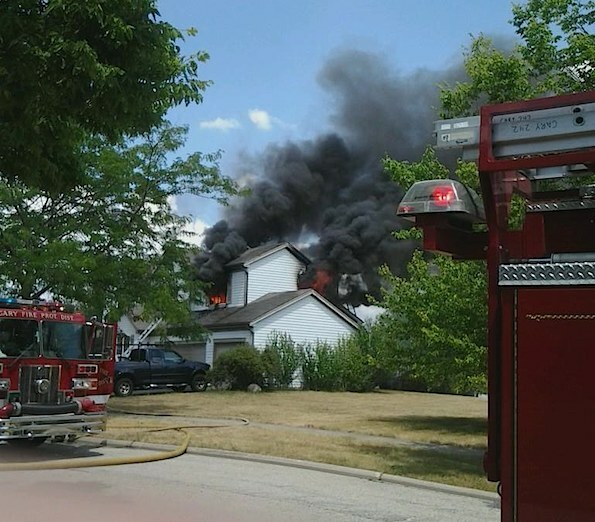 Heavy, black smoke and fire showing from the second floor of a two-story house in Cary Monday afternoon (PHOTO CREDIT: Tyler Tybolt/Facebook.com/FireRescueChicago). Cary police and firefighter/paramedics responded about to a house fire in the 700 block of English Oaks Drive. Firefighters responded to a report of a fire on the second floor of the house. Firefighters arrived to find the second floor well involved with flames and smoke showing. The response was elevated to a MABAS Box Alarm. Staging was at English Oaks Drive and Woodbridge Drive. Firefighters from Algonquin-Lake in the Hills, Barrington, Crystal Lake, Fox River Grove, McHenry, Nunda Rural, Wauconda and other communities assisted Cary FPD firefighters. Lakewood EMS also responded. Huntley firefighters also responded to standby in Cary FPD fire stations.